Recent release “There Are Saxons at the Bottom of Our Garden” from Page Publishing author Mark L. Williams is a poignant and compelling tale of a transatlantic journey and two siblings’ discovery of a secret family legacy. 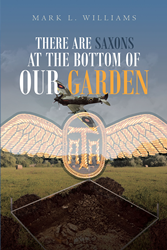 Mark L. Williams has completed his book “There Are Saxons at the Bottom of Our Garden”: a fast-paced and intriguing work of realistic fiction. Published by New York City-based Page Publishing, Mark L. Williams’s book instantly draws the reader in with memorable characters and an enthralling family mystery. Readers who wish to experience this engaging work can purchase “There Are Saxons at the Bottom of Our Garden” at bookstores everywhere, or online at the Apple iTunes store, Amazon, Google Play, or Barnes and Noble.